Need to move large, fragile or sensitive items with a high monetary value? Our Special Products Service is for you! 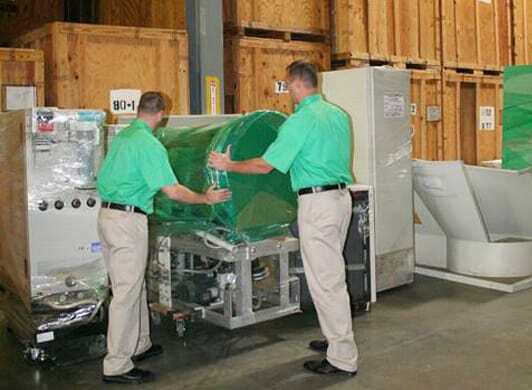 As one of Ohio’s oldest moving companies, we have extensive experience in moving unusual and extra-large items, from artwork to computer and industrial equipment and everything in between. Our padded van service can save you time and money by eliminating the cost of extensive packaging. We individually wrap each piece of cargo or pad it with a quilted blanket to protect it during transit. For high-value electronics, we also use anti-static bubble wrap and shrink wrap to protect sensitive components. Our trained moving professionals monitor your items throughout the move process to ensure the safety and protection of your valuable goods. Light assembly, climate control and debris removal services are also available upon request. Give us a call for a free consultation and no-obligation quote. And anything that requires specialized handling. Some fragile products and specialty items require custom-made pallets and crates to protect them during moving. Our moving professionals are trained in building custom pallets and crates for any type of artwork or equipment.